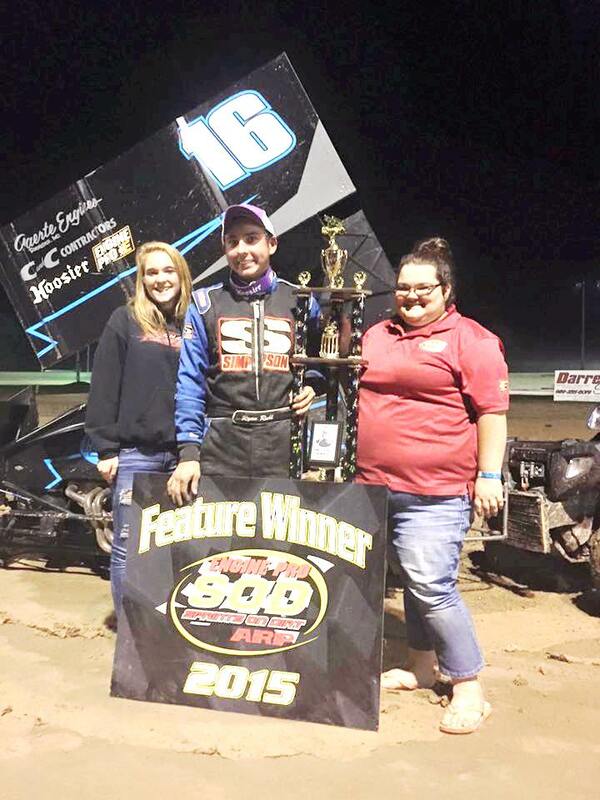 This weekend is the much anticipated season-finale weekend for the unlimited sprint cars of the Engine Pro Sprints On Dirt presented by ARP at Hartford Speedway and Crystal Motor Speedway. This Friday, September 2nd, SOD rolls into Hartford Speedway for the last time in 2016. On May 20th, the SOD season opened at Hartford Speedway after two rain outs at Crystal Motor Speedway. It was Hartford’s first race of the season on the widened track and SOD’s first race under the new, unlimited sprint format. With all the wild rumors and predictions that nothing but a 410 cubic inch motor could win under the new SOD rules, everyone was watching. 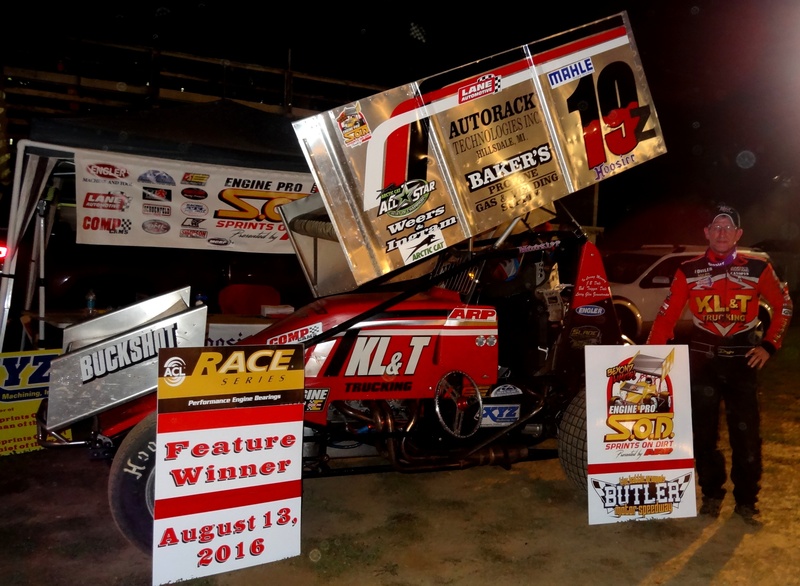 Ryan Ruhl quickly shattered the 410 myth by dominating the feature in his 360 on SOD’s biggest, fastest speedway. Brian Smith, running a twenty year old 410 that has no horsepower advantage over current top-line 360s ran a solid second. The new SOD Hoosier spec tires performed flawlessly, as they have all season, and competitors were very comfortable on them. Friday’s race is the fourth in the five-race Beyond Limits Challenge mini-series presented by MAHLE/Clevite. Current SOD points leader Brian Smith is also the BLC points leader over Steve Irwin, Mark Aldrich, Brett Mann, John Gall, Bill Jacoby, and Eric Smith. The final race of the Engine Pro Sprints On Dirt presented by ARP takes place Saturday, September 3rd at Crystal Motor Speedway where SOD has raced every year since its first season in 1980. This is the biggest, most prestigious race of the season, the Nitro Black Mike Olrich Memorial Race in support of Racing Awareness.com. 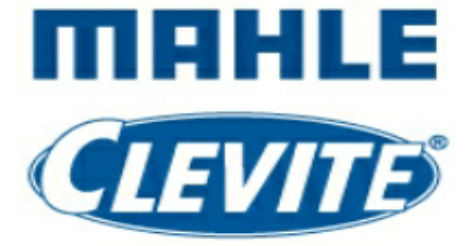 As if that wasn’t enough, it will also be the last race of the MAHLE/Clevite Beyond Limits Challenge. The 30 lap Nitro Black Mike Olrich Memorial Race in support of Racing Awareness.com will pay $2,000 to win and $400 to start. Heat races will pay $100 to win and $1,500 in sponsor contingencies will be distributed to competitors. Mike Olrich is a former Sprints On Dirt official and series director who was very congenial and well-liked by everyone in the series. Professionally, Mike was a greenhouse researcher at Michigan State University. His work lives on through a complex computer-based tool that he co-authored that provides assistance to flower growers in production scheduling. Mike was a dedicated family man who always found time to be deeply involved coaching youth sports. Michael Steven Olrich, passed away suddenly August 3, 2013, at the age of 43. SOD continues to operate with the honesty and integrity Mike was known for, and honors him every year with the Mike Olrich Memorial Race. Engine Pro’s line of Nitro Black products is the 2016 title sponsor of the Mike Olrich Memorial Race. Nitro Black is the designation reserved by Engine Pro for its premium high-end performance products. Many Nitro Black products incorporate technologies only available in the most advance performance products available. To learn more about Nitro Black products, click here. Engine Pro/Nitro Black is taking the opportunity to promote the efforts of Racing Awareness through the memorial race. Engine Pro’s entire VIP admission of fifty guests has been donated to the charity through the cooperation and generosity Crystal Motor Speedway owner and promoter Ron Flinn. RacingAwareness.com and Racing Awareness Inc. are two separate entities that were created with the sole intent of providing children and their families from Helen DeVos Children’s Hospital, of West Michigan, who are experiencing or have experienced an illness or injury of a child, a diversion from the healthcare process utilizing the sport of auto racing. To date Racing Awareness has raised over $300,000. Distribution of VIP race vouchers will be through the Helen DeVos Children’s Hospital. 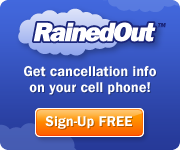 To learn more about RacingAwareness.com and Racing Awareness Inc., click here. To learn more about Helen DeVos Children’s Hospital, click here. The Nitro Black Mike Olrich Memorial Race will determine the 2016 MAHLE/Clevite Beyond Limits Challenge champion. Brian Smith currently holds a 49 point lead over Steve Irwin in BLC points. The top 16 drivers still have a mathematical chance of winning the championship. Last but not least, this weekend’s action will determine the 2016 Engine Pro Sprints On Dirt presented by ARP champion. Brian Smith has a 91 point lead over Steve Irwin followed by Mark Aldrich, John Gall, and Brett Mann. Only Irwin, Aldrich, and Gall have a mathematical chance at the championship. 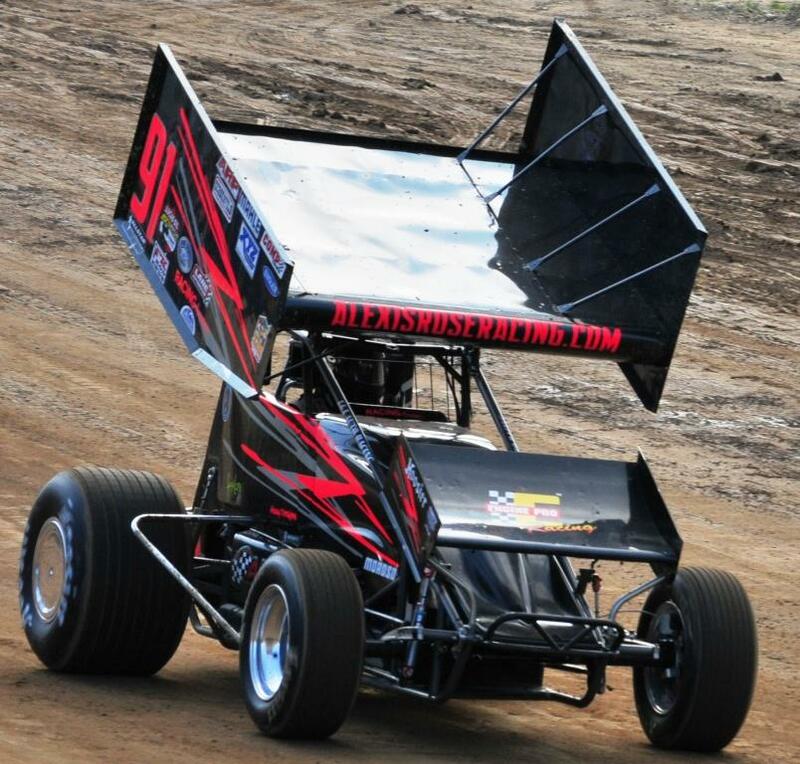 Racing Awareness associates and families are invited as guests of Engine Pro and Crystal Motor Speedway to the Engine Pro Sprints On Dirt presented by ARP Nitro Black Mike Olrich Memorial Race on Saturday, September 3rd. The memorial race is not only the most prestigious event and final race of the Sprints On Dirt season, but also the championship race of the Beyond Limits Challenge five-race mini-series sponsored by MAHLE/Clevite. Racing Awareness strives to provide joy and hope to these children and their families. In addition, both Racing Awareness Inc. and RacingAwareness.com have aspired to raise funds and awareness and share education about Helen DeVos Children’s Hospital and the nationally recognized resources it offers to the community. This is achieved through various initiatives including fundraisers, public expo appearances and special events as well as public and private donations. To date Racing Awareness has raised over $300,000. Over the past six years, several thousand patients, families and staff associated with Helen DeVos Children’s Hospital have visited speedways on behalf of Racing Awareness. 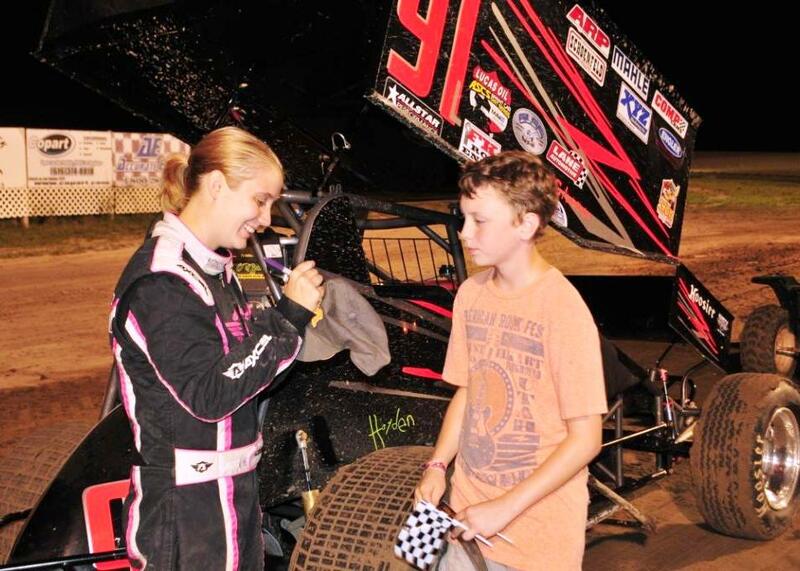 Lexi Adgate was one of the original kids that Racing Awareness “adopted.” Lexi is now a Sprints On Dirt competitor and will racing at Crystal during the memorial race. Lexi Adgate, one of the original Racing Awareness kids. For general information about Racing Awareness, go to https://racingawareness.com; on Facebook, search for RacingAwareness or @RacingAwareness; on Twitter and Instagram type @RacingAwareness. For specific inquiries about Racing Awareness, contact Jeff or Norm at talktous@racingawareness.com. 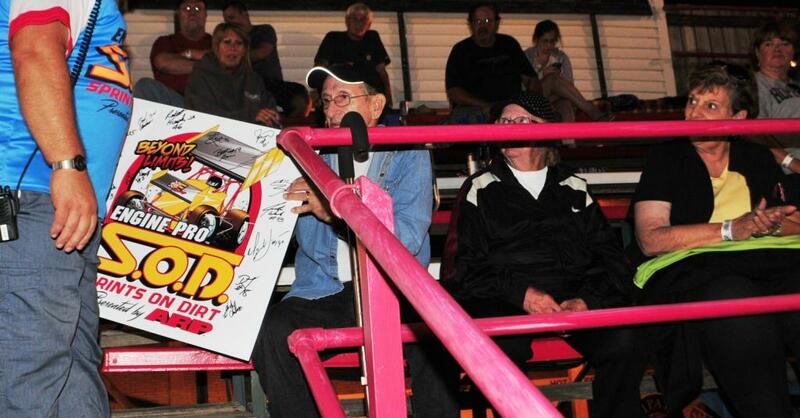 At each Engine Pro Sprints On Dirt presented by ARP event, SOD gives a 24” x 24” sign of the SOD logo autographed by all drivers to one carefully selected recipient. Referred to as “We are SOD,” to sign was originally intended to be given away through a drawing. It was decided, though, not to give it to someone who was lucky enough to win a drawing, but to some who is perhaps not so lucky. While We are SOD has very little monetary value, we hope that it is priceless in the hearts of its recipients. Up until our August 19th SOD show at I-96 Speedway, We are SOD has been awarded to young recipients, but thanks to a suggestion from Mike Mouch and I-96 Speedway, it went to someone just a little older, Wayne Landon who was born in 1931. It is a safe bet that many people do not know who Wayne is, but if you have been around open wheel racing in Michigan long enough, you know him. Wayne has over 300 feature wins, at least 15 championships, and has raced at over 50 different tracks in the US and Canada. Wayne is a member of the Michigan Motor Sports Hall of Fame. Please take the time to read Wayne’s MMSHoF biography at http://www.mmshof.org/inductees/wayne-landon/. Wayne’s story is much bigger and more tragic than is normally seen in a racing family. About fifty-seven years ago it was Wayne who was racing when a wheel flew off his car and into the stands, killing his young daughter, Rita. Thirty-seven years ago, his second son, Terry, was killed in a highway crash. Then, in 1989, Wayne Landon and his wife Ruth were in the stands at Kalamazoo Speedway and saw the crash that caused the death of their oldest son Jerry. Jerry was racing a mini-champ car when the car in front of him spun out of control, clipped his car and sent it flying head-on into a retaining wall. You can read the report of Jerry’s death at http://articles.latimes.com/1989-05-02/sports/sp-2547_1_mel-kenyon-tragedy-hits-racing-family-veteran-race-driver. 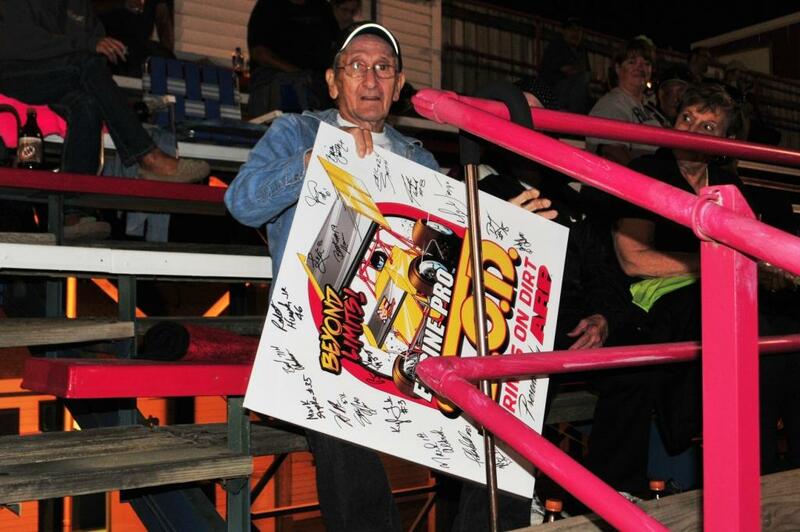 Wayne has been a major player in Michigan oval track racing, and who could be more deserving of receiving We are SOD. SOD is proud to honor Wayne Landon as one of our own. 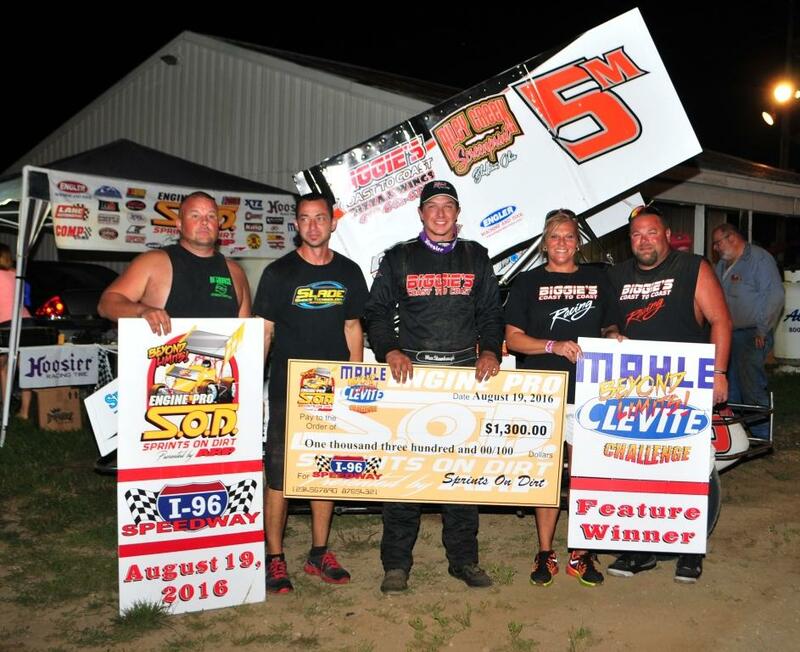 IONIA, MI (August 20, 2016) – Mad Max Stambaugh won the Engine Pro Sprints On Dirt presented by ARP MAHLE/Clevite Beyond Limits Challenge at I-96 Speedway in Lake Odessa, Michigan. Stambaugh charged to the lead from his outside front row starting position over pole starter Brian Smith and never looked back as he set a torrid pace on the superbly prepared track. Brad Lamberson, in the Melling Performance Parts, Smith Motorsport #71H, charged past Smith to take over 2nd and had plenty of speed, but Stambaugh had built up a straightaway lead. The race ran caution free until disaster struck on lap 22 when Lamberson, John Gall, and Doug Zimmerman all flipped violently at the entry of turn three. All three cars were destroyed, but after the track safety crew meticulously evaluated the drivers, all were cleared. Back under green, the 25 lapper was quickly completed. Mark Aldrich suffered a cut right rear tire while lining up for the feature and had to go to the work area and change the tire. As a result, he had to start last in the feature and charged to a 4th place finish. 5. Andy Chehowski (20A) – 14.933. Doug Zimmerman photo by Kimber Cramer. In spite of nearby rain and surrounded by threatening weather, the Engine Pro Sprints On Dirt by ARP Butler Bash ACL Race Series High Performance Engine Bearing drew a full field of competitors and thrilled fans with a typically exciting SOD program. The feature line up was led by a couple drivers who likely have the most combined win and championships in the Butler Speedway sprint division, Doug Zimmerman and Ken Mackey. Making them more formidable was the fact that Mackey won the regular Butler show last week and Zimmerman finished second. Mackey jumped into the lead at the start and held a narrow margin over Zimmerman for two laps until Zimmerman made a turn four pass to take the top spot and begin to pull away. While Zimmerman was flying in his customary high groove, Mackey tried to find a quicker line. Mackey’s night ended a few laps later when he pulled to the infield with mechanical woes. Zimmerman was flying high and opening a full straightaway lead as seventh place starter Ryan Ruhl suddenly was in second and when Zimmerman slipped of the top of three and four, Ruhl jumped into the lead as Zimmerman lost several positions. Now Ruhl appeared to be in command, holding a several car length lead over Zimmerman who had worked his way back up to second. Then, on lap twenty, the caution flew for the first time due to debris on the track. The ensuing restart had Zimmerman right on Ruhl’s rear bump, and on lap twenty-three Ruhl slipped high in turn two, allowing Zimmerman to pull even with his. As the leaders charged through three and four, they touched and Ruhl spun to a stop off of turn four. Ruhl was able to restart at the rear, but Zimmerman drove off to the impressive SOD Butler Bash ACL Race Series Bearings feature win and the $1,700 SOD / ACL Bearings / Steve Smith & Robert Flannigan Big Money check. As has been the norm in every SOD show under the new, beyond limits package on SOD’s Hoosier spec tires, close competitive racing and few cautions highlighted the racing.